We live in a world where the telling or seeking of the truth is not the norm. Sadly, many feel comfortable being told something masqueraded as the truth. Too, there are many who claim to be the repositories of truth, but who actually deal in the dispensing of error and the lie. In this article, I will show you some of the indicators in this world that show that there is a certain blindness; a certain rejection; and a certain repulsion for not wanting to get to the bottom of a matter and a not wanting to know the truth. Before I begin, I be straight-forward with you so that you will know what is in my heart and the experiences I have had in the world. (I am well traveled and have visited and either lived or worked in most countries. At present, I live and work in a country in Africa). Please permit me to state that I am an African American who has – since the age of 7 – have been involved in the religious system called by men, Christianity. For more than twenty years, I was a faithful and loyal baptized Jehovah’s Witness. On my own, I quietly left the Watch Tower organization by disassociation. My departure was a great shock to the many who knew me. It was most unexpected. I say all of this to let the reader know that what I am about to write is through the eyes of a person of African descent and not to be interpreted as anything racist; though there will be those who will view it as such because it will be the only way they can maintain the lies of the status quo of what is being dispensed in the world as the teachings of Christ. If any presume to think what I am about to write is racist, then I caution you, they do not want you to know the truth; neither are they interested in it either. This is the major indicator of deception. Come on, let’s face it, everything one sees with regard what is called by men, Christianity, is European-based. Do I lie? Honest hearted ones know it is true. For example, look at the image portrayals of Adam and Eve, Noah, Moses, The Prophets, Jesus, Angels, and even The Creator within the literature, art, and film. They are portrayed as persons of European-descent. Growing up as a child, one of my favorite movies was The Ten Commandments starring Charleston Heston who played Moses. As a child I did not know better (and neither did my parents). What I saw was a popular story in the Bible casted primarily and almost exclusively by White actors and actresses. Unknown to me as a child, those visual images on the movie screen subliminally implanted in my young and impressionable mind false images. Why would someone portray these persons in the likeness of the European? For what purpose? 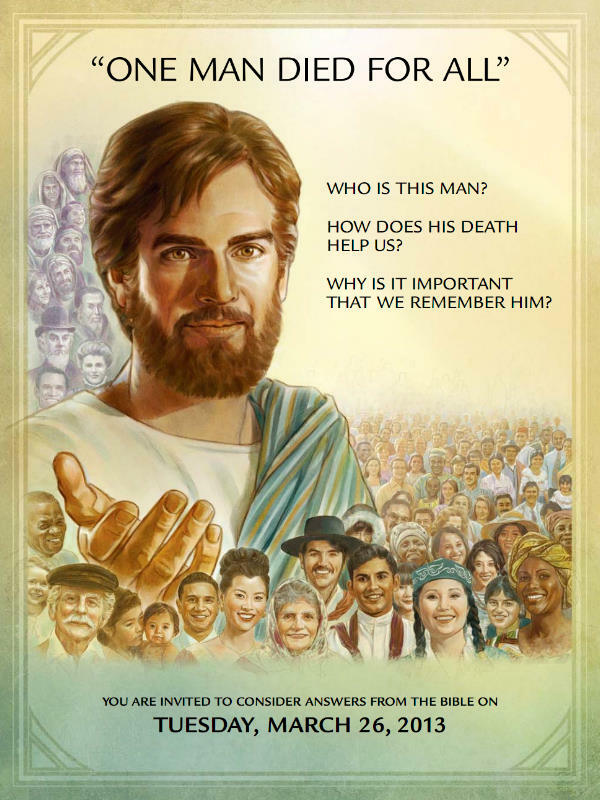 As a Jehovah’s Witness, my family and I would sit at the meetings and read and study from the many publications and what was – and still is – inescapable are these same images of Adam and Eve, Noah, Moses, The Prophets, Jesus, Angels, and even The Creator portrayed in the likeness of the European. Why? For instance, no one in ancient times or in our time today as ever seen Adam and Eve. So why are they being portrayed as White people? No one today has ever seen Jesus, so why is he being portrayed in the likeness of the European? What is most disturbing about of all is this: How can people who claim to be proclaimers and believers of the truth sit by idly and be OK with this? Have they forgotten that the Creator of all is an impartial God and does not show favoritism? Have they forgotten that there are other races within the human family that are not of European-descent? Why would they do this and be so comfortable with it? 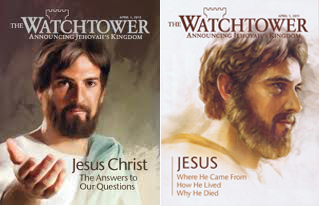 Below are typical (and some recent) depictions of Adam and Eve and Jesus in Watchtower publications. 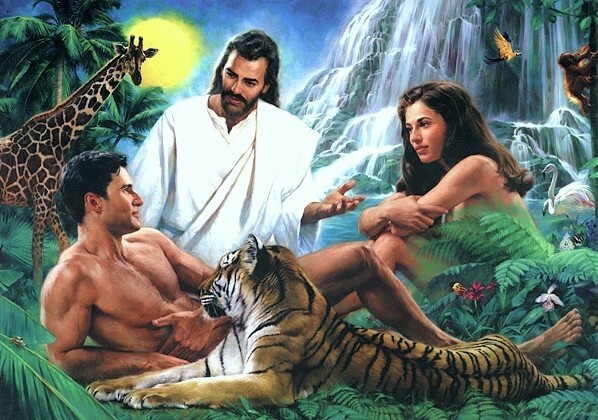 Adam and Eve and Jesus As White People (Perfectly Groomed By The Way) This is ABSOLUTELY SHAMEFUL! A White Man? 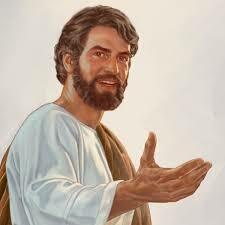 This is not Jesus! (This is VERY concerning?) What is the subliminal message? What Are People of Color All Over The World is Supposed to Think? Should This Be Accepted? 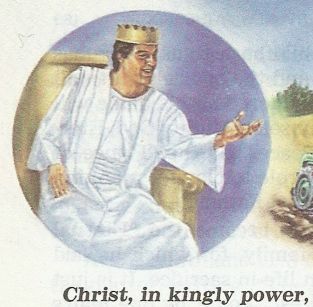 Jesus As King In Heaven As a White Man. Yet, Christ Is A Spirit-Creature In Heaven. Is This a “Fear The White Man or Else” Message? Christ And The 144000 In Heaven Riding Forth. All White Men. All In an Angry and Violent Posture. Is This Really a Subliminal Message of White Conquest of the Earth? Any person claiming to be a disciple of Christ who sees these false portrayals and is OK and comfortable with them have been taken into captivity by a great system of deception. Everything showed above is false. The images are false. The persons in them are not the true Adam and Eve or Jesus! Yet, millions believe them true and will fight you tooth and nail to maintain the error rather than speak out against such misrepresentations. Religious organization will not stand for it. They created these false images and own them and insist upon those with them hold them true in their minds and hearts. As far as I am concerned this is nothing but a deification of a particular race within the human family. All over the world, there is a dread and fear of that particular race. In the United States, for example, if one enters into a “Black” Church, posted on the walls within many of them are pictures of Jesus portrayed as a White man. In the land in which I am currently living – Africa – the White missionaries did their jobs very well. Black people everywhere here revere the White man. They have pictures of Jesus as a White man hanging on the walls in their Churches and homes. 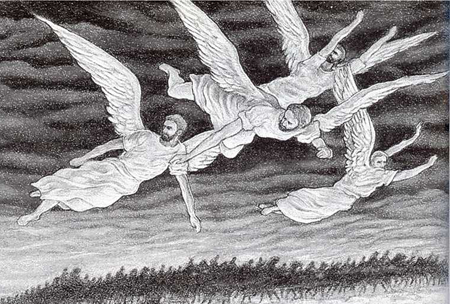 Many have a difficult time envisioning God, Christ, Adam and Eve, and angels otherwise. They do not look at each other with the same reverence as they do the White man. Why is that? It is because they have been indoctrinated to fear and revere the White man. This is pounded into them every time they step into a Church or Kingdom Hall as this all they see in literature. This is very very wrong. What is even sadder is that many White people trample all over the earth and they teach this to the “natives” and are OK with it. A few years ago, I had a co-worker who becomes angry with me because I told her Jesus was not White. She cursed and condemned me to a fiery hell for rejecting that belief. Isn’t that incredible? But it does reflect a predominate mentality that exists all over the world. It is White Supremacy stuff, people! There, I said it. Do you see any other race among the human family predominating or even sharing? No! And people wonder why the White man is revered and feared in the world. 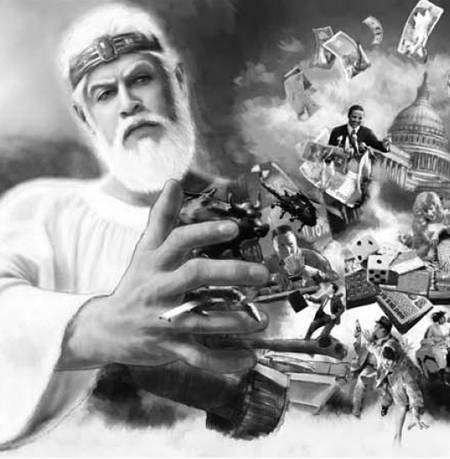 His most powerful weapons are not guns and weapons of mass destruction, his most powerful weapon is the religious system he has forged called Christianity. It is not of God and Christ. Christianity is the primary misleader of people. It is poison, vicious, and deadly. It is totally opposite of what Christ is and taught. On e-Prophetic, thinking is allowed. One should be free to speak of things like this and not be made to feel guilty because others do not want to hear it. It is a fact that the lamb-like teachings of Christ have been wrongly and violently imposed upon the world by the so-called Christian missionary efforts. History bears this out. All one has to do is look at The Spanish Inquisition that was instituted by Pope Innocent III (1198-1216) in Rome. In the Inquisition, people were persecuted and burned at the stake for heresy and for not converting to Christianity. Then we have the violent war Crusades of 1095, also endorsed by a Pope (Claremont) against Muslims. We have the African Slave Trade, also endorsed and ordered by a Pope (Nicholas V). This Pope gave the Portuguese the rights to acquire slaves along the African coast by force or trade. We have modern instances of so-called Christian nations – led by those of European descent, who have created and used against other members of the human family some of the most terrible weapons of mass destruction. Yet, people think this is of God? What this all tells me is that something is very very wrong and that this very same system of religion has indoctrinated and convinced the people within them that all of this is OK. It is interesting how the very ones claiming to follow Christ have followed the violent pattern of those who persecuted Christ. I personally reject the false images of my Master as a White man. I know that he is a powerful and invisible spirit being who resides in the heavens above. I know that is also true of The Creator and of the angels. I reject the arguments of persons who blindly say, “These are just images.” That expression is a cop out and it tells me that such persons have no real interest in the truth and seek to maintain the gross error. According to Col 1:15 God is invisible. Therefore, a spirit is invisible. Angels are also spirits and invisible. So our visualization of them should not be as “flesh and blood” entities (men), but as invisible entities and especially with regard The Creator, we must worship Him as such. What I write is not by any means to minimize what Christ taught but to champion what he taught and to show that bulk religious organizations have usurped and stolen that which is not theirs: They have taken ownership of property they did not pay for. They handle and treat that property as if it is theirs. The property: Mankind. No system of religion, no matter how they might appear to be, can direct, teach, insist upon, judge, condemn, accept or discard that which is not theirs. Only the owner can do these things. Yet, this is precisely what religious organization has done: It has taken the property of the Master and treats it as if it is their own. They even make that property fear them. Look out that nobody misleads YOU; for many will come on the basis of my name, saying, ‘I am the Christ,’ and will mislead many. Christ is saying that many will be taught to believe that he is the Christ, but those teaching them (the sources) will use that teaching to mislead many. This accurately fits what is called by men, Christianity. Christianity, which as taught many, truthfully acknowledges and teaches that Jesus is the Christ, but it (Christianity) will mislead many. Today, many stand at a crossroad. Sitting on top of many controlling them is Christianity (This includes The Watch Tower Bible and Tract Society). This thing lies. I could begin with one of the other denominations within Christianity, but I will use the Watch Tower Bible and Tract Society because it claims it has the truth. I want to show – though sincere – that those with her (Jehovah’s Witnesses) have been misled not to believe what Jesus taught about certain matters; and further, that the Watch Tower organization has more control and influence over them than the one who is their Master. In other words, the Watch Tower organization has stolen property that is not theirs. Lie Number 1 – The 1914 Date – I written about this extensively on this website. In fact, this is the primary reason why I quietly disassociated myself from the Watch Tower organization. To me, it was a simple matter of choosing to listen to Christ or listen to an organization of men a few men sitting at the top of it claiming to head God’s Earthly Organization. The Watch Tower Bible and Tract Society teaches that Jesus’ second presence (return) invisibly occurred in the autumn of 1914 and he became king in that year. It used the prophecies of Daniel to come up with this date. Actually, this is not true. The 1914 date did not originate with the Watch Tower Bible and Tract Society. It originated with the Second Adventist in which Charles Taze Russell (who later founded the organization known as The Watch Tower Bible and Tract Society) was a member. When Charles Taze Russell broke away from the Second Adventist movement (now known as Seventh Day Adventist), he borrowed the 1914 date brought it with him when he founded the Watch Tower organization. He also says that it is not for us to be knowing times and seasons, these things belong only in the jurisdiction of the Father. This ties in perfectly what he says at Matthew 24:36: Concerning that day and hour nobody knows, neither the angels of the heavens nor the Son, but only the Father. Even he himself does not know. So how can an organization of men know what Jesus says that he himself does not know. My choice was clear: Listen to Christ and reject what the Watch Tower was teaching. (Luke 9:35) One would think I stole something because I took a hit from friend and family members for my stand. You may notice that I used the expression “disassociated myself quietly.” I say this because oftentimes the organization will not let you leave quietly. Why? Because they cannot say anything bad about you. If they do, it would be a lie. It is better for the Watch Tower organization if one leaves noisily because – that way – they can make an example out of you as being a rebellious or misled one. I have even had persons – I believe purposefully – try to provoke me to step out of my usual character to become agitated so that could have something to present to the other members. I did not bite on their trap and gave them nothing. One of the Elders who visited me became agitated. I remained calm and in full control treating them with kindness and respect. You see, I really believe and trust in Christ teachings. Lie Number 2 – The Sign – In the Reasoning Book published by the Watch Tower organization on page 234, they speak of the sign of the last days as being the events mentioned in Matthew Chapters 24 and 25; Mark Chapter 13; and Luke Chapter 21. Notice that I said “The Sign” as being events (plural). … what will be the sign of your presence and of the conclusion of the system of things? Notice that his disciples asked for the sign. The last time I checked, a sign or the sign is a single event, not a series of events. A series of events would be signs. Yet, the Watch Tower organization – and I well know this having been a JW for more than 20 years – teach that the events mentioned in chapters of Matthew, Mark, and Luke i mentioned above, make up a composite sign. Now see, right there we have a made up word: composite. And then the sign of the Son of man will appear in heaven, and then all the tribes of the earth will beat themselves in lamentation, and they will see the Son of man coming on the clouds of heaven with power and great glory. Read more about that sign here. The point here is this: The Watch Tower speaks of a composite sign containing multiple events within it; Jesus speaks of and gives a single event – or sign. Who do I believe? Well, that is a no-brainer! I side with what Christ says. Once again, I even had representatives of the Watch Tower try to convince me otherwise. Yet, something inside me said that some much more was in operation here. Someone or something did not want me to listen to what Christ said. Instead, it wanted me to listen to what an organization says. That would mean then that the thing wanting this of me was in control of the “mouth” attempting to convince me not to listen to Christs words. This what happened to Christ when he was being tempted by the devil. The Devil tried to get him not to listen to and obey God’s words. There are other lies – many taught and believed upon unwittingly – I could go into, but many of them are covered on this blog. It really boils down to recognizing that there is a human force in the world that is intent on usurping and controlling mankind. It is a thief that has already taken property that is not theirs. It has even mishandled, misused, and if it chooses, discards and disposes of that property as if they paid for it. My kingdom is no part of this world. If my kingdom were part of this world, my attendants would have fought that I should not be delivered up to the Jews. But, as it is, my kingdom is not from this source. Yet, millions think that the religious organizations they sit proudly and comfortably in are his. Hence Jesus also, that he might sanctify the people with his own blood, suffered outside the gate. Let us, then, go forth to him outside the camp, bearing the reproach he bore, for we do not have here a city that continues, but we are earnestly seeking the one to come. This is where I exist at present. Not a member of any religious organization. Rejecting all of them and clinging to the person and teachings of a person: my Teacher, Head and Master Jesus [the]Christ. I am his disciple. I truly understand what he meant now by being no part of the world. I am in a wilderness of sorts, but I sit before my Master to be taught by him. Yet, the world and it’s religious organizations are always on the prowl seek to recruit (devour) me. 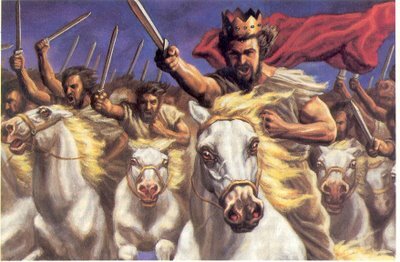 I have effectively warded them all off and they have no answer because the Word of God is powerful and they cannot stand. Their only recourse is to act towards me and others like me as they did my Master. They become like the Pharisees claiming to be godly. Yet, their true intention is to prevent you from hearing Christs teachings and become his disciples. They want YOU as their disciples; misleading you to believe that you are Christs disciples if and only if you join them. There is your thief! They tell you that you are a disciple of Christ. Only the owner of them can tell you who they are. The baptismal vow all Jehovah’s Witnesses take state that they are servants of God (Jehovah’s Witnesses) ONLY if they associate themselves with the God’s spirit-directed organization (Watch Tower organization). I would ask: “Is that up to an organization to decide? Should not the purchaser and owner of mankind determine and chose who are and who are not servants?” One one who is a thief would make such a statement. No human can tell me or anyone else who I am or who I am not in relation to God and Christ. But that is exactly what religious organization has done. It establishes a system of rules, regulations, requirements, conditions and rituals a person must pass before they are inducted into being a servant of Christ and worshiper of God. What is all of that? It is the work of thieves. They have no business handling persons (property) that is not theirs to handle. We have one Master. Make him such and wake up and stop letting men and their organizations direct you as your master. Do not be afraid of them. Join me and sit down with me in front of our Master and let him teach us together. Previous ArticleIs The Good News of the Kingdom Being Preached? Next Article Where Did The 1914 Date Really Come From?